A favourite topic amongst beginners and enthusiasts alike: how long is a rapier? How long should it be? Is there an optimal length? Does the length of the rapier matter or is it what you do with it…? Let’s start with a fundamental question: what is a rapier? Common understanding loosely agrees that a rapier, from espada ropera, is a loose term for a type of slender, sharply pointed sword; a straight two-edged sword with a narrow, pointed blade, that can be used for cutting and thrusting. Confusingly, rapiers come in a huge variety of blade lengths, widths, hilt types, weight and balances. Few masters at the time referred to a rapier, often using the common term spada or sword. It’s only our later obsession with classifying and typing everything that exposes the wide and often blurry lines in weapons development in which ‘rapier’ spills over into tuck swords, mortuary swords, and the ill-defined war rapier. Given the deadly nature of the weapon in skilled hands, it seems useful to have the longest blade you can manage in order to keep the other fellow as far away from you as possible, whilst reaching in to deliver your own attacks from long range. 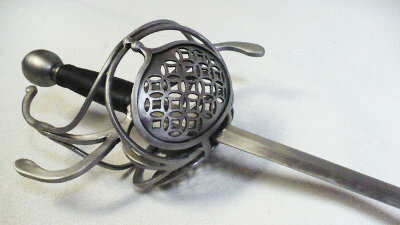 From this premise, at the extreme, rapier blades could reach an unwieldy length of sixty inches or longer; impractical to carry and actually limiting in technique much beyond the straight thrust. However, in this literal arms race, the man with the shorted weapon could feel at a distinct disadvantage. The perceived ‘unfair advantage’ gave rise to some city ordnances empowering the city guard to snap such ‘over-length’ weapons to a legislated maximum length. So if there’s a maximum practical length, then what should the optimum length be for a rapier? Renaissance fencing masters disagreed. Some, such as Thibault, scoffed at longer blades; Thibault’s own recommended length was that the cross of the sword be level with the users’ navel when standing naturally with the point resting on the ground. Cappo Ferro appears to favour a total weapon length reaching from the ground to the armpit (assuming a reasonable complex hilt and grip), although it depends how you interpret the text. In Chapter III: The Division of Fencing That is Posed in the Knowledge of the Sword (Wilson/Swanger translation), section 36: “Therefore the sword has to be twice as long as the arm, and as much as my extraordinary pace, which length corresponds equally to that which is from my armpit down to the sole of my foot. This is less than clear cut, since we can’t be sure if he is talking total weapon length (a shorter measure) or just the blade length (a longer measure). It also doesn’t help describing two measures using the arm and lunge length – the lunge being an open question of itself. Both these measures bring into focus the relative height and reach of the sword user. Renaissance manuals contain considerable attention to body mechanics and geometry, which would indicate the optimum length of weapon will vary according to the individual user, with the compromises between attack, defence, speed and handling determining the preferred weight, balance and length of the weapon. Which is probably why all my training rapier blades are short at 37 inches, when by Cappo Ferro’s measure they should be around 38 to 40 inches, and my taller colleagues might be more comfortable with 43-47 inches. So rather than try to formulate a mathematically precise answer, perhaps the better question is ‘what length of blade can I personally handle to best advantage?’ by which I mean cut comfortably, thrust accurately and parry strongly.